In the streets around the hotel, it seems only eating establishments are in evidence that are formal, with higher prices. 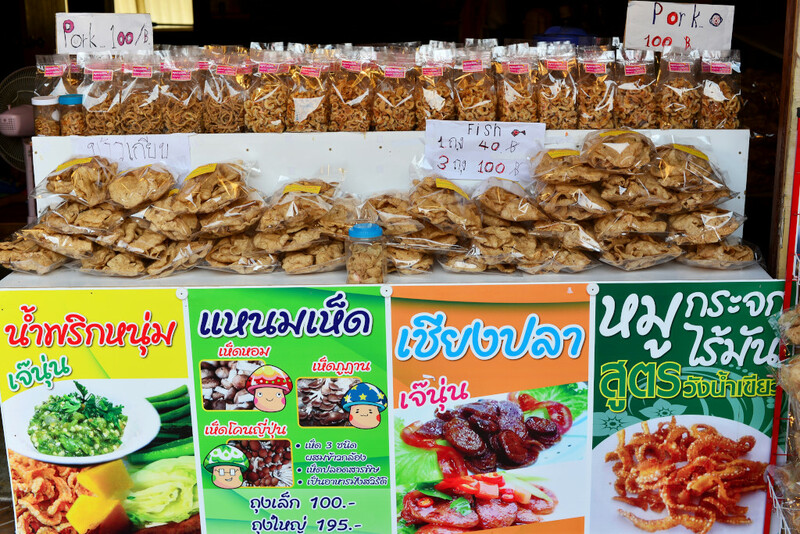 The search for authentic and inexpensive fare always a challenge in tourist zones, although Thailand tends to draw upon an endless reserve of local food in the resorts piggybacking on larger urban environments, such as Hua Hin and Cha-Am. On the renowned beach islands I doubt matters would be as easy. 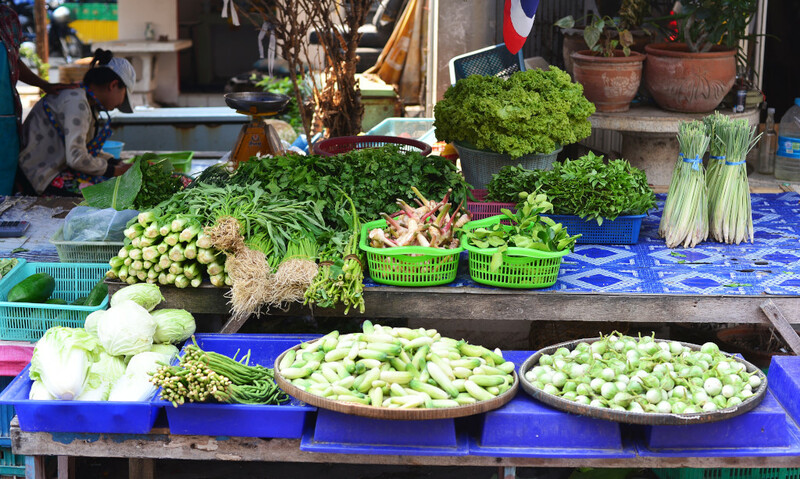 The pickings are slim be around the Tong Mee, and I would hazard a guess that closer to the market there would be more modest and inexpensive options, although the 50 baht I pay for a noodle soup at one is really excessive. 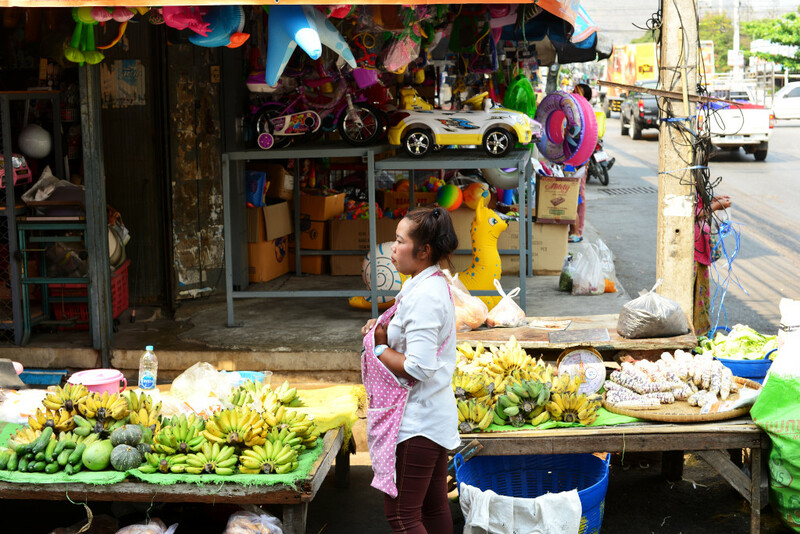 Nearer the market, the sunshine and dazzling array of produce entice, as do the friendly, relaxed vendors seated in front of their wares, including an ample selection of meat, fish, fruits and vegetables. I eye the oranges, pineapple, banana, papaya, longan, marian plums, and jackfruit, paying the same amount for a large pineapple that I would normally pay for a few slices of the sweet tangy fruit, telling how low the prices are this deep in the market. I encounter a very Thai curiosity, a few stalls with colourful amulet vendors catering to the Thai proclivity for the supernatural. Even this far away from the fray, women target me for their massage ventures, although the fabric of the morning market is mostly earthy, vibrant and warm, replete in photogenic visuals. Small tailoring workshops remind the visitor that many people in this fine country don’t roll in easy tourist-driven money, but their welcoming smiles are still forthcoming. 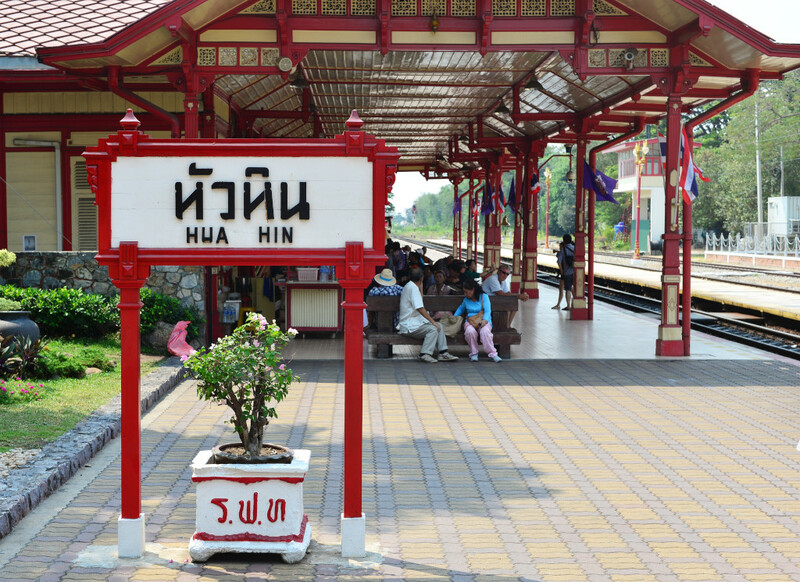 One of the star attractions of Hua Hin is the train station, not far up from the market, built specially for receiving the king in the resort intended to facilitate his recuperation. A series of bungalows feature Buddhist decorative aspects, golden bargeboards cresting the red timbered and taupe-framed buildings. 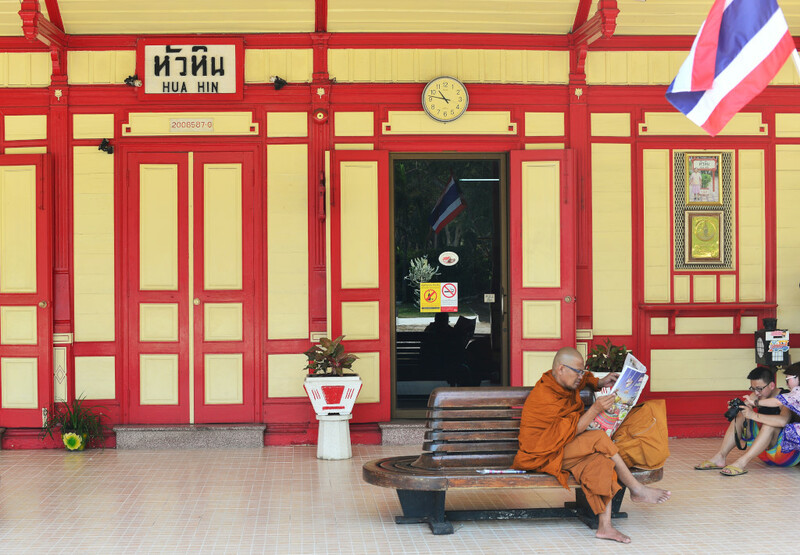 A few tourist, locals and monks linger in somnolent positions on shaded benches, the broad sun-baked plaza lining the tracks waiting for the rare train lumbering its way to the Malaysian border in the deep troubled south of the country. In the centre of town are a few rare teak bungalows that have survived the unforgiving depredations of time. A side road leads to the entrance of the Royal Palace, the gardens only open early mornings and late afternoons. I am told sternly that sandals are not OK, nor can I bring a backpack into the golf course-like park. Given the usual micro-management and trigger-happy humourless mindset at another royal enclave, my desire to be here has dropped from ambivalent to wanting to leave as fast as possible, and without firing off a few choice words that would land me in prison for a few years or more. Plearn Wan is a whimsical shopping area across from the Royal Palace that is in some manner intended to replicate a sense of traditional Thai village life, and as far-fetched as such a notion may be, its presentation may somewhere be adequate, given the extent to which Thailand has been distilled to a consumer experience. 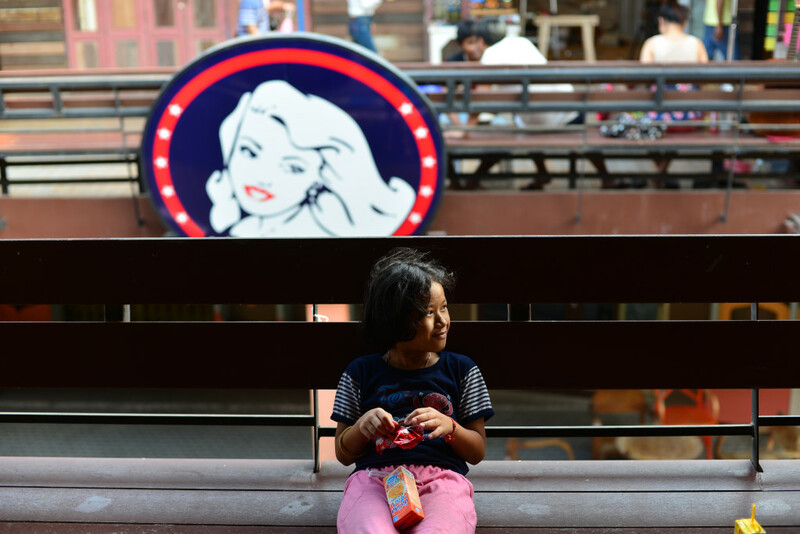 Rows of booths of several levels flog excerpts of Thai street food and whimsical toys of no intrinsic value. Families and lovers congregate uncertainly, eating, buying, taking selfies, a classic juncture of the postmodern Id. Back in town, the usual debate as to where to eat. Apparently, there is a vegetarian restaurant in the soi radiating out from my guesthouse, but I never find it, and wandering deeper into the forest of bright neon, I discover a heretofore unknown wonderland that had been lying all along before my doorstep. On the one hand, the alleys are clean and well-maintained, brightly lit, the restaurants and bars well-furnished, inviting, offering presumably quality selections of food, ranging from Thai to various European cuisines, even evoking a touch of calibre, the towers of the Hilton hotel towering overhead with a broad plaza dedicated to large-scale posh eating and drinking establishments. And yet on the ground, the sight of the grizzled older European men seems somewhat amiss, walking either slowly or attempting to appear more virile, the huge guts preceding them, disheveled thinning grey hair, clasping hands with some local women at very least 40 years their junior, often much more. But wherever I look, I see the same, the bars and restaurants almost universally filled with young local women at best looking at me expectantly, often calling with utterly insincere sultriness. 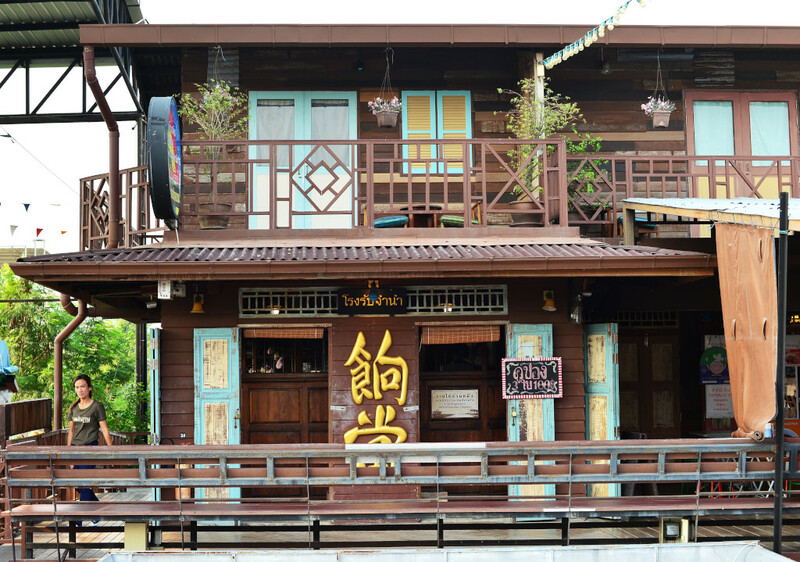 Many of these establishments could be inviting, but all I want to do is flee this place – except that the core of Hua Hin is replicated all through Thailand. Even worse, I am lost, with no idea as to where I am. A group of English set me straight, pointing me in one direction to Buffalo Bills by the jetty, and to the the Hilton Hotel at the other end, which is where I had intended on heading towards to begin with in my search of the vegetarian restaurant. 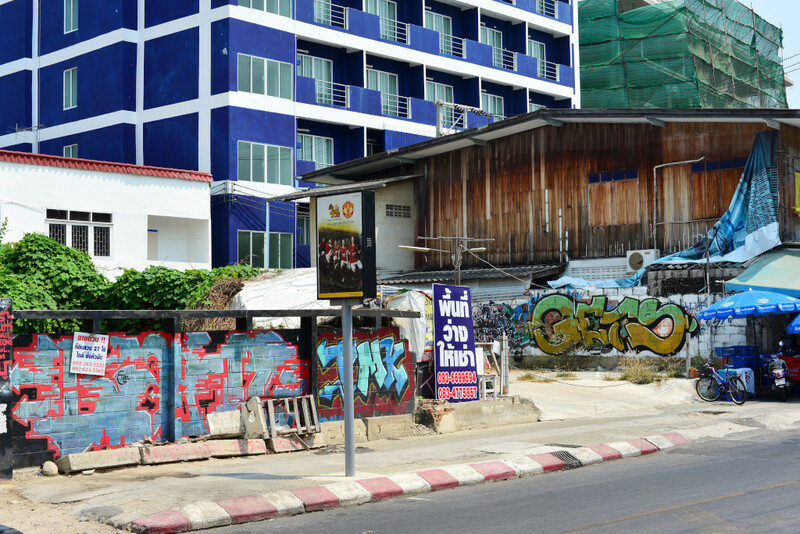 But nothing, nothing other than the glorified whorehouse environment, and so when I reach Thanon Phetkasem, I am happy to move on to the night market again. The night market is still swamped with people, a large number of whom are tourists, thankfully less of the demographic I just waded through near the Hilton Hotel, but the few seated seafood establishments definitely charging good prices for the pleasure. Better yet are the last few stalls in the daytime market area, where locals vie for the day’s remaining business at the same competitive prices they began the day with many hours before.